Discussion of the EVAP midterm report continued on Day 3 of the 68th session of the WHO Regional Committee for Europe (RC68). Delegates from 19 Member States made interventions, and representatives of nongovernmental organizations spoke on behalf of medical professionals and students. While emphasizing the importance of immunization and welcoming progress, speakers expressed concerns regarding the resurgence of measles, declining coverage rates, vaccine hesitancy, and supply and funding challenges. Member States described steps taken to overcome barriers to achieving high coverage, and called for increased collaboration and sustained political commitment. An observer representing the United States of America’s delegation also expressed concern about measles outbreaks, noting that they serve as a warning that public health systems are not as strong as they should be. Dr Nedret Emiroglu, Director of the Division of Health Emergencies and Communicable Diseases and Director of Programme Management, pledged that WHO/Europe will continue to work with Member States and all partners to help increase demand for immunization, improve data collection, develop a roadmap to address issues in middle-income countries (including vaccine procurement and supply) and ensure evidence-based decision-making on immunization. Delegates described the Strategy on the health and well-being of men in the WHO European Region, which is based on promoting a gender-sensitive approach to health and human rights, as groundbreaking. improve gender equality by engaging men in self-care, fatherhood, unpaid care, violence prevention, and sexual and reproductive health. A panel discussion with delegates from Ireland, Portugal and Sweden highlighted key developments in their countries’ work on men’s health. Delegates stressed the importance of strengthening advocacy and partnerships; aligning actions with national priorities; developing a patient-centred approach; considering gender and masculinity as a factor for health; and creating greater awareness of society’s perception of what it means to be a man and father. In the interventions that followed, Member States and non-State actors supported the resolution and welcomed the adoption of the Strategy. The resolution was adopted by consensus. Dr Claudia Stein, Director of the Division of Information, Evidence, Research and Innovation and report team lead, informed delegates about the key findings of the “European health report 2018”. She stressed that most European Member States have taken significant steps towards achieving key Health 2020 targets. However, progress across the Region is uneven, varying within and between countries, between sexes, and across generations. In addition, current trends in lifestyle-related risk factors, especially alcohol consumption, overweight and obesity, give significant cause for concern. The results presented in the report reflect an ongoing shift towards using new forms of evidence that go beyond numbers to capture subjective experiences and explore the social and cultural drivers of health and well-being. Member States were urged to join the WHO European Health Information Initiative, which is a key instrument for integrating and harmonizing this new evidence as the basis for health policy-making in the Region. Austria and Tajikistan were nominated to put forward their candidatures to the WHO Executive Board in 2019. Croatia, Poland, the Republic of Moldova and the Russian Federation were elected to serve a 3-year term as members of the Standing Committee of the Regional Committee from September 2018. Estonia, Germany, Kazakhstan, the Netherlands, Slovakia and Slovenia were elected as members of the Regional Evaluation Group. Georgia was elected to serve on the Joint Coordinating Board of the Special Programme for Research and Training in Tropical Diseases. “Let’s not forget that the purpose of the Action plan is to protect lives from health emergencies,” opened the Executive President of the Regional Committee. Dr Nedret Emiroglu highlighted that full protection from health emergencies requires strong political and financial commitment. She noted that the Action plan is a joint product of WHO, partners and Member States, and that it supports WHO’s vision of a European Region in which the impact of health emergencies is prevented or minimized. Dr Dorit Nitzan, Health Emergencies Coordinator, outlined the inclusive and transparent process used to draft the Action plan, which is based on 3 main pillars: building core capacities under the International Health Regulations (IHR) (2005); strengthening event management; and measuring progress and promoting accountability. Implementing the Action plan will move forward countries’ work on the 2030 Agenda for Sustainable Development, which focuses on leaving no one behind. Many countries expressed their full support for the Action plan and commitment to its implementation. They highlighted the critical importance of working together and across sectors to ensure effective preparedness and response. Most considered monitoring and evaluation an effective tool to measure progress and identify priority areas for intervention. “The IHR is at the core of preparedness and response, and this Action plan reflects what is needed,” summarized the delegate from the Netherlands. In conclusion, Dr Emiroglu pointed out the areas in which WHO offers support, including strengthening health systems through IHR implementation; conducting trainings, tests and simulation exercises; and facilitating cross-sectoral participation. “Public health is at the crossroads of power and politics,” said Professor Ilona Kickbusch of the Graduate Institute of International and Development Studies in Switzerland. Professor Kickbusch underlined its pivotal societal function, a point that many delegates echoed during discussions. “Commitment to public health has been and remains a hallmark of my tenure as WHO Regional Director for Europe,” said Dr Zsuzsanna Jakab in her opening comments. She added that despite the Region’s leadership in recent decades, “we must advance public health to take account of current and future societal demands”. The Regional Director explained that, in addition to serving a societal function that involves everyone, across government sectors and through all levels of government, public health is a coordination mechanism for intersectoral action and an expert function within health systems and beyond. 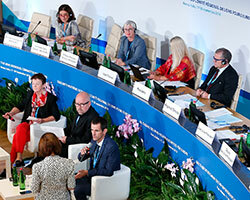 Dr Jakab called on Member States to endorse a 10-point priority action plan to help countries advance public health. Actions include upgrading the public health workforce and making health systems environmentally sustainable. bringing public health and primary health care services together for health promotion. Several Member States expressed their support for the paper, and the 10-point plan was adopted. Participants at this lunchtime briefing considered various factors that will affect health systems in the future, and ways to reorient health systems to be more effective and sustainable. Delegates from Belgium and Slovenia as well as the Centre for Local Economic Strategies (CLES) in the United Kingdom and the Organisation for Economic Co-operation and Development (OECD) introduced proposals. These included finding better ways of measuring success and societal well-being beyond gross domestic product (GDP); reducing waste (in OECD countries, adverse events occur in 1 in 10 hospitalizations and up to 50% of antimicrobial prescriptions are unnecessary); and investing more in prevention. Dr Tom Goodwin of CLES explained the concept of anchor institutions (such as hospitals and local governments) which, because of their size, can offer strong economic and social benefits in local areas. Giving an example from Manchester, United Kingdom, he explained that in the past the City Council spent 50% of its budget on local suppliers. When CLES intervened and encouraged local purchasing, this figure rose to 70% within 3–4 years, creating 6000 more jobs in the community. In ways like this, Dr Goodwin argued, health system institutions can have a positive influence on the broader determinants of health within communities. “Refugees are not a burden.” With this remark, Professor Emine Alp Meşe, Deputy Minister of Health of Turkey, concluded her intervention. The side event dedicated to the Refugee Health Programme was an informative and emotional session during which participants learned about the Turkish model of universal health coverage for Syrian refugees and the social inclusion of Syrian health-care workers. The panel included WHO leadership in this area of work, with presentations from the WHO Country Office in Turkey, the WHO Health Emergencies Programme and the WHO/Europe migration and health programme. Delegates expressed genuine appreciation for the efforts of Turkey and WHO to train about 1800 Syrian health-care workers and to integrate over half of them into the Turkish health system. In 2017, these people were able to provide 433 000 consultations and vaccinate 413 000 Syrian children free of charge, overcoming linguistic and cultural barriers. Dr Emiroglu concluded by citing text from the photo exhibition: “From hardship to inclusion and hope.” This is the true lesson to export to other countries in Europe and the world. “When it comes to NCDs, there are no silver bullets or single policy solutions. Systems thinking is needed,” said Dr Melitta Jakab, Senior Health Economist at the WHO Barcelona Office for Health Systems Strengthening, during the launch of the new report. She stressed that scaling up best buys and making an impact on NCD outcomes requires a comprehensive and aligned health system response. The report provides pragmatic and actionable policy recommendations in 9 policy areas that are particularly relevant to addressing NCDs with a focus on socioeconomically disadvantaged and vulnerable populations. Dr Jill Farrington, Coordinator of Noncommunicable Conditions in the Division of Noncommunicable Diseases and Promoting Health through the Life-course, noted that the report is relevant and timely for all Member States in the Region, regardless of their level of health system development. Its insights are aligned with the commitments of Health 2020, and pave the way to universal health coverage and many of the SDGs. On Wednesday morning, delegations gathered to gain insights into WHO’s country work from WHO representatives in the Region. Dr Lucianne Licari, Director of Country Support and Communications, welcomed delegates and invited several of the WHO representatives to tell the story of how they came to play this role in their current countries. WHO representatives informed delegates of the functions of WHO country offices, the services they provide in countries, the role of WHO within the United Nations country teams, how they coordinate with other partners, and the impact of United Nations reform at the country level. Delegates inquired about the challenges of WHO’s work in countries, and the critical aspects for achieving results and ensuring that WHO provides complete, efficient and effective support to Member States. Issues raised included sustainable and predictable financing; collaboration with United Nations agencies and other partners with uneven resources; and ways in which WHO’s 13th General Programme of Work (GPW13) impacts not only WHO but also ministries of health. Delegates expressed appreciation for such direct exchanges. WHO/Europe has 5 technical centres known as GDOs. These “powerhouses of innovation” provide evidence, advice and tools for policy, research and capacity-building in key technical priority areas. Often offering direct technical assistance as part of technical teams, they contribute to building public health capacity in Member States. Funded by their host regions and/or governments, each GDO is accountable to a technical division and is an integral part of WHO/Europe. This breakfast briefing provided an opportunity for heads of the GDOs to share examples of their work and discuss how they provide support and added value to Member States. Ms Christine Brown, Head of the WHO European Office for Investment for Health and Development in Venice, Italy, provided examples of new evidence and groundbreaking methods developed by the Venice Office that confirm that the health sector, far from being a cost, is important for economic development and stability. The evidence shows that in 16 European Union countries, the health sector is ranked on average as the ninth-most important sector (out of a total of 62 sectors) for its contribution to the national economy when measuring GDP. As part of the interactive exhibitions at RC68, delegates have been testing their knowledge of the SDGs by taking a quiz with 18 questions linking health to each of the Goals. The quiz is also available online.